The Western Upper Peninsula has had many issues with energy such as high electric utility rates and limited access to natural gas. 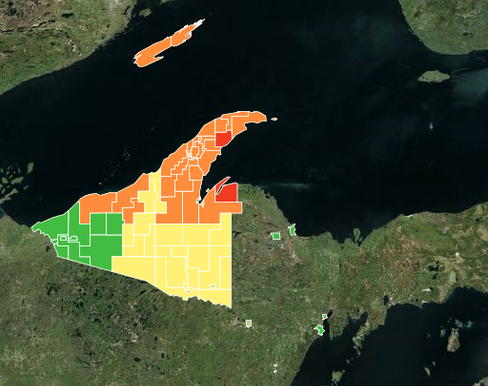 WUPPDR has identified a number of opportunities to help mitigate high energy costs for the Western U.P. The map displays electricity rates of Western U.P. residential customers at the local level (e.g. city, township). Data for residential energy prices was provided by the Michigan Public Service Commission, and the Energy Information Administration. As of June 2016, Michigan’s average residential retail rate is $15.38 cents per kWh. Residential retail rates are based on the rates for 500 kWh customers on September 1st, 2016. The map displays electricity rates of Western U.P. commercial customers at the local level (e.g. city, township). Data for electricity prices was provided by the Michigan Public Service Commission, and the Energy Information Administration. As of August 2016, Michigan’s average retail rate is $13.56 cents per kWh for commercial customers consuming 5,000 kWh monthly. Commercial retail rates are based on the rates for investor owned utilities for 5,000 kWh customers on August 1st, 2016. Municipal utility rates were provided by the Energy Information Administration. Rates for OCREA were calculated from 2015 Financial and Operating Report. 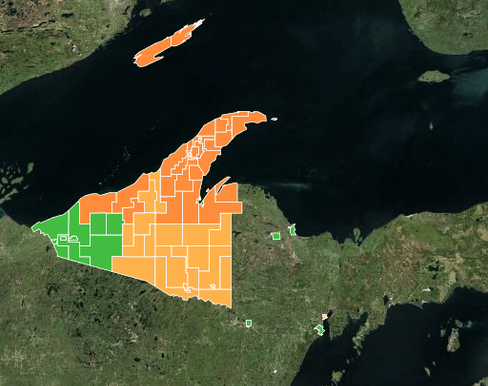 This map displays natural gas access at the township level for the six western counties of the Upper Peninsula. Data for this map accessed from the Michigan Public Service Commission. 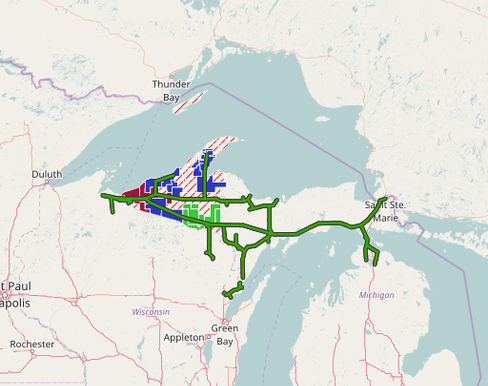 The map also reflects natural gas transmission lines for the Upper Peninsula via data from the Energy Information Administration. 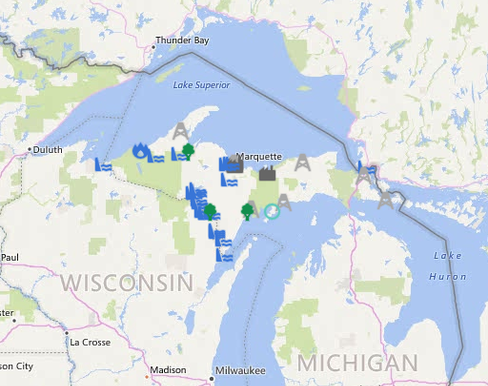 This map provides information on potential sites for renewable energy projects in Michigan’s Upper Peninsula. Data for this map was generated through the U.S. Environmental Protection Agency’s RE-Powering America’s Land Initiative. The U.S. Environmental Protection Agency (EPA) initiated the RE-Powering America’s Land Initiative to demonstrate the enormous potential that contaminated lands, landfills, and mine sites provide for developing renewable energy in the United States. EPA developed national level site screening criteria in partnership with the U.S. Department of Energy (DOE) National Renewable Energy Laboratory (NREL) for wind, solar, biomass, and geothermal facilities. While the screening criteria demonstrate the potential to reuse contaminated land for renewable energy facilities, the criteria and data are neither designed to identify the best sites for developing renewable energy nor all-inclusive. Therefore, more detailed, site-specific analysis is necessary to identify or prioritize the best sites for developing renewable energy facilities based on the technical and economic potential. Please note that these sites were only pre-screened for renewable energy potential. The sites were not evaluated for land use constraints or current ground conditions. Additional research and site-specific analysis are needed to verify viability for renewable energy potential at a given site. The federal- and state-tracked sites included in this screening represent a subset of nationwide contaminated lands, landfills, and mine sites. RE-Powering screened sites currently tracked through EPA remediation and grant programs, as well as sites tracked by 11 state agencies. Additional sites are tracked at the state and local level. This map represent the electric and natural gas transmission network in the Western U.P. if you would like more information please contact WUPPDR.